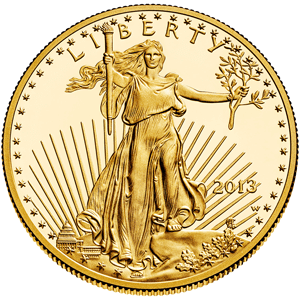 American Gold Eagle is an official gold bullion coin of the United States. It is extremely popular for their beautiful, patriotic design and gold value. Since its stability, liquidity and diversity, the investors are pleasure to add to their investment portfolio. The American gold eagle was first released by the United States Mint in 1986. From 1986 to 1991, the Gold Eagles minted are dated with Roman numerals. In 1992, the United States Mint switched to Arabic numbers for dating Gold Eagles. 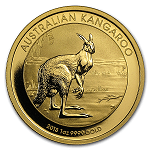 Since the recent years, it has become the world's most widely traded gold bullion coin. Each American Eagle Coin has a striking imagery which indicates the American spirit and character. The obverse design, is a graceful Lady Liberty with flowing hair, holding a torch in her right hand and an olive branch in the left, with the inscription " LIBERTY " and includes both the date of issue and the individual mint mark of origin, that was first created by Augustus Saint Gaudens for the 1907-1933 $20 U.S. Double Gold Eagle gold coin. The reverse design is "A Family of Eagles" which features a male eagle carrying an olive branch flying above a nest containing a female eagle and her eaglets, designed by Mrs. Miley Busiek. There are four sizes of American Gold Eagles: 1 oz, 1/2 oz, 1/4 oz, and 1/10 oz, and their corresponding face value are $50, $25, $10, $5. Those face values are legal, reflecting their issue and monetized value as coins. However, the face value of gold eagle is not equal to the market value. 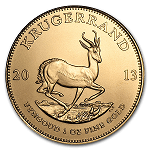 In fact, each American Gold Eagle's price is according to the current market gold spot price plus a premium per coin. 1. The American Gold Eagle owns graceful design, and guaranteed by the United States Government to the stated amount of actual gold weight in troy ounces. 2. The gold eagle coins are with high liquidity, you can trade with the price of gold market value almost anywhere in the world. 3. 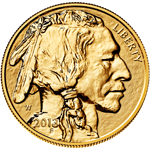 The American Gold Eagle Coins are small and exquisite, so that easy to store, or transport. 4. 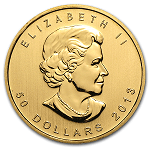 Unlike other gold bullion coins, the American Gold Eagles are acceptable for your precious metal IRAs. 5. Distinguishing from other gold bullion coins, the American Gold Eagle is one of the most private investments which is non-reportable the IRS by brokers. 6. The gold eagle coins are minted in 22 karat gold, alloyed with a small amount of copper and silver which protect it against damage.